Female chefs have gotten more attention lately, but it's still pretty rare to find a female sommelier. Well, you can meet one at the very approachable Vintage Enoteca in Hollywood: Danielle Francois. It's not a frou-frou wine bar, but a friendly, casual place where locals hang out or go on a date while trying some interesting wines. In fact, while Danielle is the in-house sommelier and part-owner, the other owner is also a woman. Owners Danielle Francois and Jennifer Moore worked in advertising in New York City. Tired of the of the advertising world, they moved to Los Angeles and opened Vintage Enoteca, wanting to create "a casual environment to explore and sip interesting vino and eat simple, yet delicious tapas that complements the wine." They opened Vintage on June 1st 2010 and Danielle went on to get her sommelier certification with The Court of Master Sommeliers. I took a look at the wine and beer list and was surprised at the number of unfamiliar names and varietals on both. I mean, I thought I've learned quite a bit about beer and wine over my blogging years, but still. There was Scheurebe from the Rheinhessen, a Grignolino from Piedmont or a Blaufrankish from Burgenland. The only word I recognize there was Piedmont! Anyway, I came in for a casual wine pairing dinner, starting off with a refreshing glass of Pascal Bellier "Reverie" Brut Rose from Loire Valley, France. 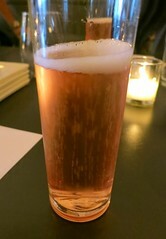 This sparkling rose is 100% made of pinot noir grapes and going to be perfect in the summer months to come. The food, as they claimed, is simple and affordable. The small bites are $6 and all the salads, flatbreads, and paninis are $10. While it wasn't on the tasting menu, one of the other writers had heard a lot of their Crispy Duck Cracklings Salad ($10) and wanted to try it. 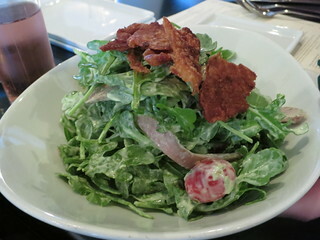 The salad was composed of blue cheese, blistered baby tomatoes, arugula, creme fraiche dressing, and topped with duck cracklings. 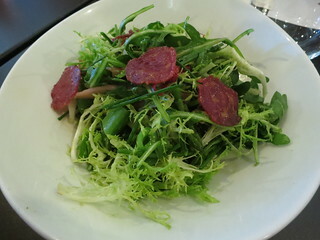 I'm glad we got to try this salad, tossed with the right amount of dressing. 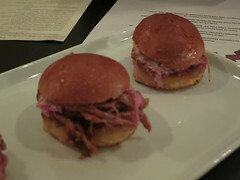 Of course, it's the duck cracklings that made it special. 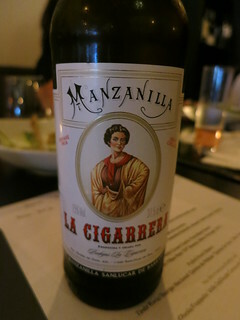 This was paired with Palomino: La Cigarrera Manzanilla NV, Sanlucar de Barrameda, Spain. Nope, not a white wine. This is a sherry! This dry sherry pairs very well with the anchovy vinaigrette, cutting the saltiness and fishiness. Danielle explains that the dry sherry pairs well in general with salty snacks. Txakolina has an unusual salinity. It is usually a white wine and it's very rare to get a rose, so Danielle stocked up on it. Filipa Pato is a female winemaker from the Beira region of Portugal. This white wine is a blend of 2 local varietals (bical and arinto). 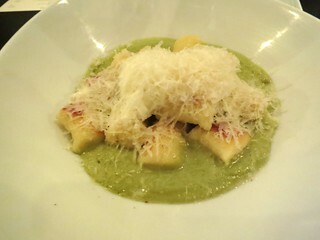 It has a light creaminess that helps pick up the creaminess of the gnocchi dish and really balances the sauce. This was a very nice pairing The gnocchis themselves were nice and fluffy and I enjoyed the garlicky sauce. The red wine is pretty light and crisp but soft and luscious, with nice dark fruit flavors which brings out the sweetness of the bbq sauce while softening out the edges of the bold flavors. Tinta Roriz is another name for tempranillo while touriga nacional is an indigenous varietal of Portugal. Moving on, the Nero d'Avola is full bodied. 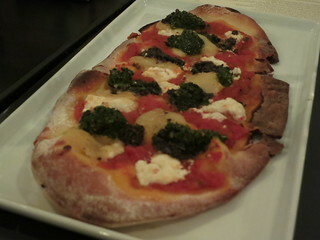 The tomato sauce brings out the natural acidity of the wine. Dessert options here include ice cream sandwiches and seasonal fruit tarts. 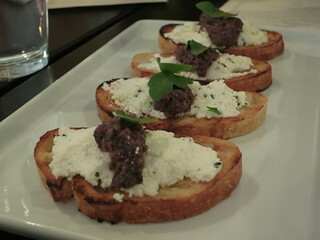 Vintage Enoteca is a nice, casual place to play around with unusual wines. It's affordable and Danielle is friendly and helpful. They also have several weekly specials including $7 grilled cheese on Mondays, $12 bottomless blackberry sangria on Saturday and Sunday brunch, and happy hour (with half off most food) on Monday-Friday from 5-7pm.